You won’t miss Cadel in the bunch aboard his custom painted ‘Ozzie’ Canyon Ultimate CF, a commission given to a German designer. There’s plenty of evidence that he’s getting the Royal treatment from sponsors; Cadel’s bike has a Super Record groupset, where the other Silence-Lotto team riders are riding standard Record, an exclusive pair of the new Look Keo 2 Max pedals with a titanium axle and a specially designed Ritchey carbon WCS seatpost with a larger than usual layback, to achieve his desired saddle position. Mavic’s latest top end R-SYS Ultimate wheels are also very rare right now, with less than twenty pairs at the Tour and costing a small fortune. 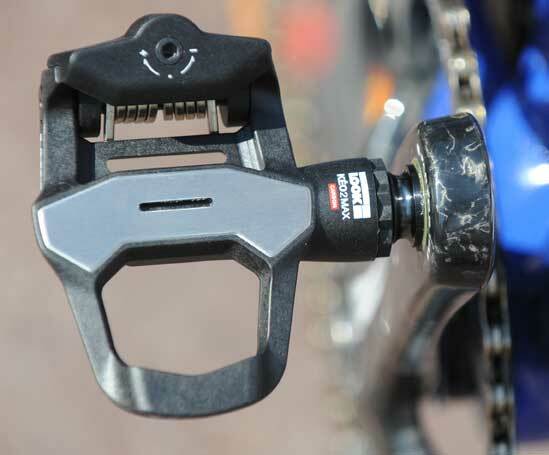 Cadel is likely to be using these for the hills and reverting to the Cosmic Carbone Ultimate on the flatter stages.